[ELGIN] Glossary: Serial Number, Grade, Model, Class, etc. From the very beginning, Elgin was finishing and selling over 100 watches per day and were working on thousands more. So, it isn't surprising that they needed some way of organizing and classifying these watches to make it easier to manufacture, for marketing purposes and for watchmakers to order parts to repair them. These three needs overlapped, and in some cases conflicted with each other, more over, things changed as the decades went by. The result is the somewhat complicated and confusing set of systems we find today. Serial Numbers, organized into "runs", such as the run of serial numbers from 16311001-16312000 were all grade number 392 watches. Grade Numbers, such as 180 or 478, which were B.W. Raymond named watches. Grade Names, such as the B.W. Raymond railroader's watch, or the G.M. Wheeler gentleman's watch. Watch sizes and model numbers, such as 16s model 9, which were all open face, 3/4 plate three finger bridge models, with lever setting. Class numbers, such as 114, which were all medium to low quality 12s model 3 watches. Similar terms were used by other American watch companies, although the details of what they meant could sometimes be quite different. To simplify things, only Elgin's usage will be discussed here. If you are interested in just an overview of this subject, just read the section summaries. Manufacturing and later by watchmakers for repairs. Required to correctly identify the grade and to estimate the age of a watch. 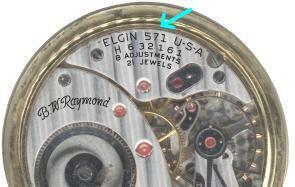 Elgin placed unique serial numbers on their watch movements. The serial numbers were allocated in "runs" or blocks of identical grade watches. Starting in the late 1930s, Elgin added a letter prefix to the serial numbers of some watches and around this time, Elgin also started to mark the grade number on some of the movements in addition to the serial number. In the late 1940s, Elgin started to sell Swiss made watches and around this time, Elgin stopped placing serial numbers on some watches they made in the USA. The Swiss didn't place serial numbers on any of the watches they sold to Elgin. By the late 1950s, Elgin had pretty much phased out the use of serial numbers. The first watch Elgin made in 1867 had the serial number 101, and they continued to use serial numbers up into the 1950s. Elgin organized the serial numbers into "runs" of identical grade watches. For example, the first run is from serial number 101 to 1000, which were all B.W. Raymond 15 jewel 18s railroad watches (grade number 69). The second run was from SN1001 to SN1800, which were all H.Z. Culver watches (grade number 62), a small step down in quality from the first run. Elgin normally allocated runs of serial numbers in a multiple of 1,000, starting with serial numbers that end in 001. Most runs were for only 1,000 watches, but for very popular grades, the runs could be 10,000 or more. Looking at the serial number lists, it appears that Elgin would allocate runs of watches periodically (monthly?, maybe quarterly?) based on the demand for the different grades. Since it took around 6 to 18 months between the time the first parts of a watch were manufactured until the watch was actually finished, it is likely that the watches from a given run may have been in many states of completion at any time. Elgin appears to have allocated serial number runs in sequence and so the finished watches came out of the factory watches at least somewhat in order. We can use the serial number to approximate the date of production but these dates aren't exact because different quality watches took different amounts of time to complete and large numbers of the partially finished watches could be set aside to make way for faster selling watches. Once a watch was finished, it was placed in stock, and watches from several different runs of the same grade were often shipped in a single order. At best, the serial number will date a watch to within a year or two, but it could often vary by much more. This is especially true for high end watches, the first few runs of a grade or model, the last few runs of a grade and low production watches. In general, the more interesting the watch is, the less accurate the serial number will date it. It appears that when Elgin was creating a new grade of watch, they would allocate a few blocks of serial numbers to work with and then went on to work out all the bugs with the machines and production techniques. This means that the first runs of a new grade would actually be sold at least a year or two later than other watches that had serial numbers around the first run. New models tended to take longer to develop than new grades based off of an existing model. There are other cases, such as the first runs of grade 149 and grade 150, that were being advertised about a year earlier than the serial numbers would normally imply. The last few runs may have taken years to sell, and watches may have been finished up very slowly. Similarly, high end watches were often slow sellers and there is evidence in the Elgin Master Records that Elgin was still finishing and selling watches over a decade after the serial number would normally imply. Starting in the late 1930s, Elgin added a letter prefix to the serial numbers on some watches. It is not clear why Elgin did this, but around this time, Elgin had opened up a second plant. All of the watches produced in this first series of watches with letter prefixed serial numbers were the first time these grades had been produced, and often the first of a particular size or model. While some other grades went from not having a letter prefix to being produced with one, none of the grades in this first series of letter prefixed watches were ever produced without a letter prefix in their serial number. The first letter prefix that Elgin used was 'X' which, considering all the new things that went into that series, could easily have stood for "experimental". They then followed with other letters in seemingly random order, such as 'C', 'E', 'T', 'Y' and 'L'. Some watch companies have used letter prefixes to hide how many watches they are producing in any given year, and how "old" the watches are that they are shipping. It is not clear if this was the reason why Elgin started to use letter prefixes, but by the end of WWII, Elgin had completely phased out the use of serial numbers without a letter prefix. The last serial number list that Elgin published was from 1950, so all the runs after that are not documented. The "generally accepted dates" for the serial numbers say that Elgin used about one letter per year, which would mean that Elgin continued its regular production of about a million watches per year. However, at the same time, Elgin was producing watches that had no serial numbers, as well as importing Swiss watches that didn't have serial numbers, so either Elgin was selling more watches than its historical average, or the letter prefixes spanned more than one year. There is other evidence that Elgin strung out at least the last letter prefix ('I') over a number of years, and quite possibly they stretched the last several prefix series ('R', 'P', and 'K'). For example, The only railroad grade pocket watch that Elgin was making in the 1950s was the grade 571, and they didn't start selling the B.W. Raymond grade 730 wrist watch until 1961. The "generally accepted dates" for the last run of grade 571 would place it in 1954. I have a hard time believing that Elgin didn't produce a single railroad grade watch for 7 years, or that they instantly switched over to wrist watches. Another sign that Elgin strung out at least the last letter series is that the last year had 38,000 grade 571 B.W. Raymonds allocated to it, more than any year since 1950. In the late 1940s, Elgin started to sell Swiss made watches and around this time, Elgin stopped placing serial numbers on some watches made in Elgin. The Swiss didn't place serial numbers on any of the watches that Elgin bought from them. It is not clear if these two events are related, but it probably would have been hard for Elgin to get the Swiss to mark their watches with a unique serial number and keep everything straight. Besides, since the early 1940, Elgin had started to mark the grade number directly on many of their movements, which made serial numbers obsolete. Watchmakers for repairs, manufacturing and, when first introduced, for sales. Used to identify the quality and rarity of a watch. You can think of the "grade number" is being a product code. Watches with the same grade number were almost always manufactured exactly the same. Generally, any time the slightest thing in a watch changed, Elgin would change the grade number, but in a few cases, Elgin changed minor things such as added jewels, or changing how closely a watch was adjusted. In a handful of grades, there were radical changes, but these watches were generally manufactured before grade numbers were introduced. After a somewhat chaotic start, Elgin assigned grade numbers sequentially with little regard to how the grade numbers related to each other. So, knowing what a grade 273 watch looks like won't help you to figure out what a grade 272 or a 274 watch is like. Well, other than knowing that those three grades were probably created around the same time. If two Elgin watches have different grades, there is something physically different about them. The difference can often be quite minor, and often not visible without taking the watch apart. The reverse, however, isn't always true. Sometimes Elgin would change watches without changing their grade numbers, but this was the exception rather than the rule. The most common change was adding additional jewels, but Elgin made other changes as well. The largest changes made without change the grade number were to grades such as 5, 10, 13 and 78. These grades were converted from slow train, right angle escapements watches to quick train, straight line escapements. This would require a change in the number of teeth on the gears, location of the gears, the shape of the fork, and the balance and hairspring. The other example is grade 12, which appears to have been manufactured in at least three different forms, to match at least three of different names that this grade was produced with. The M.D. Ogden grade 12, for example, had a compensated balance, and had 11 jewels, while the Chas Fargo grade 12 had a solid balance and had only 7 jewels. There seems to be a little confusion over grade numbers by many people which appears to be caused by The Complete Guide To Watches by Cooksey Shugart et al. In the Elgin section, they show drawings of the different models that Elgin made with a short description to help people identify their watch. In particular the first grade that used a particular model of movement is listed, but, due to how the words are phrased, people think that any watch that that matches this picture is that particular grade. Often the first grade of a given model is a very high end watch and so people think low grade watches are high grade ones instead. The grade numbers don't refer directly to the quality of a movement. A higher quality watch may have a lower grade number. So, in general, a higher grade number just means that the first of these watches were made later, but there are a large number of exceptions here too. Some other watch companies would do things like make the odd numbered grades be hunter case watches, while the even numbered grades would be open face watches, but Elgin didn't do anything like this. Up until the mid to late 1870s, Elgin used grade names to keep track of the different types of watches they made and had no concept of grade numbers. Around this time, Elgin started producing "Nameless" watches, with just the company name on them. At the same time, or maybe a few years later, Elgin went back and assigned grade numbers to all grades, including the watches that had previously only had a name. This is the reason why the very first watch that Elgin produced was a grade 69 instead of what you might expect to be called grade number 1. The grade 1 is a nameless grade, and was assigned its number before Elgin went back and assigned numbers to their named grades. Sales, and initially watchmakers for repairs. Similar to the grade number, the grade name can be used to identify the quality and rarity of a watch, but it is often too general to be as useful as the grade number. Certain grade numbers were also given a name, such as G.M. Wheeler, Lord Elgin, B.W. Raymond, or the watch could be "nameless" with just the Elgin name placed on the movement. For sales, these names were used to target customers, for example the B.W. Raymond was the Railroader's watch, while the G.M. Wheeler was the Gentleman's watch. Before grade numbers were introduced, names were used by watchmakers to order parts. Most of the time, all watches of a certain grade would have the same name, but sometimes a grade could be marked with one of several names, for example, either "Veritas" or "Father Time". The names generally implied a certain level of quality. For example, the "G.M. Wheeler" grade was used by Elgin for their gentleman's watch, while the B.W. Raymond was used for their railroad watches. As the standards required by the railroads changed, Elgin created new grades with the B.W.Raymond name to match these standards. Likewise, not all G.M. Wheeler's were the same quality, but they were usually higher quality than nameless grades. In any given year, the G.M. Wheeler's that were made were always of lower quality than the B.W. Raymond's. Most names were used on several different grades, and could be found on watches of several different sizes and models. When Elgin started producing watches in 1867, they used different grade names to distinguish all their watches. A B.W. Raymond watch always referred to what is now known as an 18 size, 15 jewel, grade 69 watch. Later, in around 1873, Elgin introduced their first stem wind movements, there was then "key wind B.W. Raymonds" and "stem wind B.W. Raymonds". That still wasn't too confusing. Things changed in the mid to late 1870s when Elgin introduced "Nameless" grades. These movements were not marked with a grade name, instead they only had a serial number and the Elgin name. It is not clear to me how Elgin handled the problems with sales or the parts ordering that were caused by introducing these nameless grades. It appears that Elgin didn't publish a list of serial numbers and their corresponding grades until many years later. There isn't much information available about this time period. The only three clues that I know of are an ad from 1894, a little bit of information in the "Complete History of Watchmaking in America" by Crossman, and the Elgin grade and serial number lists. On February first, 1877 (over seventeen years ago), we announced to the Retail Jewelers that we had adopted a "Nameless" line of movements engraved "Elgin National Watch Co.", in addition to our then regular line of Trade-Marked goods. How well this has plan[sic] succeeded you can best judge from the increased demand for Elgin Watches, and also from the fact that over ninety per cent. of Elgin movements sold are "Nameless." The only Trade-Marked movements demanded by the Jewelers to-day are our "B.W.Raymonds," "H.H.Taylors" and "G.M.Wheelers," which we propose to continue as long as the trade requires them. The "Nameless" plan has, therefore, offered protection to the Jewelers, as well as having afforded them large returns for their investment. We now propose to extend the "Nameless" feature to our packages, by abolishing all grade numbers, making it impossible for the uneducated to handle our movements, as they have been able to do in the past through the identification which the character of our package affords. We, the Manufactures, have been obliged to suffer all complaints because our customers elected to distribute our product in whatsoever manner seemed most expedient. Our "Nameless" package will identify our customers in the sale of Elgin Movements, which we confidently believe will result to our mutual benefit. We have in the course of preparation the most complete as well as the most expensive Movement Holder and Tin Box Carrier for safely carrying all grades of movements of our manufacture. We will allow you at the rate of $3.00 cash per hundred for Movement Holder and Tin Box Carrier complete, or $2.50 cash per hundred for the Movement Holder; all shipments to be address to Elgin, Illinois. The issue of the above will be about July first, prox. Our offer to purchase Movement Boxes refers to a NEW box we propose to issue next July. We cannot make any purchases until after that time and for NEW BOXES ONLY. [...] Later this line [of 18s key wind watches] was further increased by the addition of four more grades of 18-size movements, named respectively the "W. H. Ferry," "M. D. Ogden," "J. V. Farwell," and "Chas. Fargo." These were introduced between August, 1869 and August, 1870. They were all named after gentlemen who had become connected with the directory. Clues from the serial number lists are much less direct and much more questionable. It appears that Elgin was much less disciplined about assigning runs as they were used as they were later on. This may have been due to having a smaller factory and their less developed machines and machine shop. If you believe the dates based on the serial numbers, in these early years, Elgin would often go for a year or more without producing any watches of some popular grades, and produce large quantities of other grades. This may have been what Elgin actually did because stocking a years worth of a grade may have been cheaper than constantly retooling the factory in order to make smaller batches. On the other hand, Elgin may have allocated runs based on the size or type of grade, and these runs may have been much larger than they intended to produce right away. The may have then only produced a few watches out of that run as needed. The first "clue" that can be found from the serial number lists is that the 1896 Material Catalog lists names for all runs up to 1874. According to the "generally accepted dates" for serial numbers, 1875 had a large number of nameless grades introduced. The first run that does not have a name is SN238001, which is a grade 13. Maybe it is a coincident, but as mentioned above, the grade 13 was one of the grades that underwent a radical change from slow train to quick train. The way that the 1894 Material Catalog lists the name for a run is not definitive. By looking at actual watch movements, it appears that if the 1894 Material Catalog lists a run as having a particular name, with very few exceptions, all of those watches will have that name. (Most of those exceptions are private labelled watches.) On the other hand, if a run is marked as not having a name, actual watches may or may not be Nameless. As a result, this "clue" probably means that there were no Nameless grades before around 1874, but Nameless grades may not have started at that point. The second "clue" from the serial number lists is that the grade numbers do not appear to correlate at all with their order of introduction until 1875. However, there are still gaps in the grade number assignments and many out of order grade numbers until 1886. Grade 1, for example, isn't produced until 1879. It is very hard to interpret this "clue". The best explanation that I can come up with is that this probably means that all the grades before 1874 did not have their grade numbers assigned until later, but the grade numbers assigned in 1875 may have taken into account the number of earlier grades that were made. However, these earlier grades weren't retroactively assigned grade numbers until later, maybe as late as the 1880s. The chaotic numbering of the grade numbers may have been intentional and part of the whole "Nameless movement" champaign. It may have been designed to make people who were not supposed to know (the general public? unauthorized dealers?) from determining what kind of watch they had. This "clue" is probably not solid enough to say anything definitive. The third "clue" is only partially from the serial number lists. By looking at actual watches, the first Nameless watch I have recorded is SN256481 (1874), which was supposed to be a GMW, but most Nameless watches don't start popping up until 1875 or so. These dates are based on the "generally accepted dates" for serial numbers, which may not be accurate, however these dates do match up with other dates. The final "clue" may well be the existence of a serial number list at all. The first serial number list that I know of is from 1896. Maybe the lack of having any grade numbers even on the shipping tins may have required a serial number list to be published. Of course, if earlier serial number lists are discovered, this clue would become irrelevant. Some of the information presented in Crossman's "Complete History" doesn't quite jibe with the information presented in both the 1894 Elgin ad, and from the grade data. Crossman says "Since the latter date [1870?] no additional grades of named movements of this size have been put on the market", but the Advance grade name (grade number 13) was introduced in 1874. This grade keeps popping up and as mentioned earlier, it was changed from slow train to quick train in ca 1880. According to the so called "Elgin Master Records", at that time the Advance name was dropped. Before then, it appears that some were nameless and some were marked Advance. This grade was fairly low volume so maybe Crossman was not aware of this grade. It may have been 5 or more years between when the last Advance grade name was used and when Crossman wrote his book. Crossman also said nameless watches were introduced in 1875, which matches fairly well with the serial number, but it is two years earlier than the 1894 Elgin ad says they were "announced". Possibly Elgin started to use nameless grades before they were generally announced. The 1894 Elgin ad also raises some questions. The ad says that nameless watches were introduced because they "offered protection to the Jewelers, as well as having afforded them large returns for their investment." It is not clear what this means, but one possibility is that nameless watches would allow jewelers to offer them at a different price point than the equivalent named grade. Another possibility is that it prevented customers from comparison shopping and from other jeweler's from easily determining what their competitors were selling. Finally, if the watches were delivered to the jeweler in tins that marked the grade, as the ad implies, and there wasn't a publish serial number list, then only the original jeweler would easily know what replacement parts would be needed for a watch they sold. A twist on the Nameless grades happened during the late 1890s or maybe the very early 1900s. Some of the grades that had been nameless started to have their grade number marked on the movements. This, in effect, created a name out of the grade numbers. It is likely that this changed happened due to railroad watch requirements that all watches needed a name or a grade marked on the movement. All the grades that had their grade numbers placed on them were railroad grade watches. This policy didn't last for too long, and around this same time, Elgin introduced a number of new grade names, such as the Overland, Veritas, Father Time, and Lord Elgin names. The the final change came in the late 1930s when Elgin again started to place the grade numbers on many of their watches. Apparently, the advantages of having nameless watches were no longer as important. By the late 1950s or early 1960s, the use of serial numbers had been phased out and replaced with grade numbers. Used when describing a watch, identify if a watch was a men's or a women's watch, and to determine which cases will fit the movement. Elgin made quite a few sizes of watches and in each size, there were different models. The model numbers determine things such as the general plate layouts, whether the watch was made for an open face case or a hunter case and the thickness of the movement. Between sizes, the model numbers are unrelated, so a 12s model 4 has no relation to an 18s model 4 (which was created decades earlier). Elgin manufactured watch movements to industry standard watch sizes. Up to the 1920s, most American watches were sold uncased by the factory. The customer would go to a jewelry store, select a watch movement from one of a number of companies that made their watches to these standard sizes, and a watch case made by a different set of companies. The jeweler would have a watchmaker put them together. Elgin uses the term "model" to distinguish which major design pattern was used for the grades in each size. For example, all 18s keywind watches have the same basic plate layouts, so all the grades are considered to be "18s model 1" watches. There is also a model 1 for the 16s watches, which looks very different. Like the grade numbers, the model numbers for each size of watch were assigned sequentially and there was no relationship between the model numbers of difference sizes. While many grades of different quality can use a particular size and model number, some models were primarily used for high quality grades while other models were used for lower quality grades. For example, most of the 16s model 1 and model 2 grades (the convertibles), were high quality grades, while most of the the 17s model 1 and model 2 were low quality grades. Elgin's documentation also used the term "style" for the early 10s watches, but it appears that this was just a synonym for "model". At least on this website, the style numbers have been converted to model numbers. Rarely used to today, but can be used to estimate the quality of a grade based on other grades in the same class. The "class number" was a way of grouping grade numbers together. All the grades in a particular class would have the same quality of parts, both in terms of materials used (brass, gold, steel, etc.) and in finish and tolerances. The "class numbers", somewhat like the "grade numbers", were created sequentially and you couldn't tell much about the watch grades in class number 32 by knowing about class number 31. The class number was a method used by Elgin to help watchmakers order the correct parts. If two parts could share the same picture in the material catalogs, they were given the same part number. Elgin made both very high and very low quality watches that used basically the same blue prints. A large part of the difference between these watches was due to the materials used, the finish of the parts and the tolerances of the parts. Watch parts could be made from brass, gold, steel or nickel. A part for a low quality watch might be made of brass while a high quality watch would have a highly polished steel part with closer tolerances instead. Back when Elgin was in business, you would order parts both by a part number and also by the class number. Now a days, you are luck to get any part that might work, and few people pays much attention to what the class number the part is for. The class number is still useful in helping collectors determine the quality of a little known watch grade. If the grade has the same class number as other high quality watches, then it is probably high quality also. It appears that, over the years, Elgin actually used the term "class" in at least two different ways. The 1888 Material Catalog lists each type of part (wheels, arbors, screws, etc. ), and for particular grade, they would list both a part number and a class number for it. The class numbers would range from 1 to 4, with class 1 being the highest quality. Later, in 1896, Elgin created the "class number" system that is used on this website and found in most books on Elgin watches. This includes Shugart's "The Complete Watches" book and Ehrhardt's "Elgin" book. The 1896 Elgin Material Catalog has this explanation of the Class number on the first page. Since issuing our Material List in 1888 [ ... ] [We] have made a new departure in the manner of classification. In the old list each particular size or series of a given article was classified by itself, commencing with Class 1 in each case; while in this, the class represents the movements taking the same grade of material. Among the many grades of movements there are several of the same class in which there is a difference in some of the material used; for instance, Gilded and Nickel Raymond, one taking a Gilded barrel and the other a Nickel. In such cases we have given the article several illustration numbers, and if the description of movement be read and the correct number of illustration be given, in addition to class, no mistake can be made in finish of article required. The idea being that the illustration serves to give the shape and not finish of material. To further illustrate this, refer to Indexes, page 37 Nos 432, 433 and 1,534 are given the same illustration; No. 432, Class 1, is Steel, for a Raymond movement, No. 433 Class 3-5, is Gilded, used on Gilded Wheelers, while No. 1,544, Class 4-5 is Nickel plated, for Nickel Wheelers. This "class" system was abandoned sometime after the 1915 Material Catalog was published. It was definitely gone by the 1927 Material Catalog. The highest class in the 1896 book is 60, and if you look at the first 60 classes, you will see that they are sorted from largest to smallest size, from the lowest model number to the highest model number, and finally by the "quality" of the watches in the class. After class 60, there is another block of classes from 61 to 86 which appear to be somewhat sorted. Maybe this corresponds to an update they did between the 1896 and 1904 Material Catalogs, I'm not sure. The 1904 Material Catalog has classes up to 117. After class 86, there is no apparent pattern other than the lowest grade in the classes generally increases. The 1904 and 1915 Material catalogs make mention of the "class" in their introduction pages, but offer few new details. Little understood and rarely used today. Elgin used several other systems to classify watches for sales, most of these are not well understood. One of these was the Streamline series of factory cased pocket watches, and the related Crusader and Corsican watches. These names appear only in marketing literature and watch case, not on the watch movements. The Streamline series started to show up in ads during the 1910s, while the other two show up in the 1920s. It appears that these are all 12 size model 4 watches. Similarly, Elgin appeared to have created a "Parisienne" series of lady's wrist watches in the mid 1920s that were all 18/0s watches. Later, with their wrist watches, they started to use "case style numbers", but other than a few cryptic references in their 1958 Service manual, I have found no more information on this system. This web site runs on 100% Open Source Software. This web page was last changed on 10/04/2002 at 00:42:26.